The Cube 400 is a high quality multi-parameter CT driven kWh meter designed specifically for sub-metering applications. This electricity flow meter has pulsed outputs for each phase and optional Modbus RTU RS485 communication which makes the meter suitable for all AMR applications. Standard models are suitable for use on all types of LV 3 phase systems and has an LED indicator for each phase. True RMS measurement to the 30th harmonic. The Cube 300 is a 96mm x 96mm DIN panel mounting unit. Suitable for use with standard 5A output CTs, or 0.33V voltage output types. Accuracy better than Class 1. 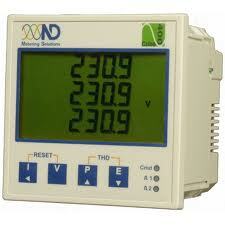 Energy meter contains a large integrated LCD display. this meter comes with a 5 year warranty and has an IP54 rating.